Are you a Linux desktop user who loves Ubuntu but is wary of Unity? You're in luck. There are lots of Ubuntu spins, both from Canonical and independent developers, which preserve the basic infrastructure and essence of Ubuntu but replace the default Unity desktop. Canonical has been producing official spins since its second release, but they have been getting more attention since Ubuntu switched to Unity. The oldest, and one of the most popular, is Kubuntu, which offers the KDE desktop; if you want Ubuntu goodness on an underpowered computer, there's the lightweight Lubuntu; and starting with the 13.04 Raring Ringtail release, users will also be able to use the Gnome desktop thanks to the new Ubuntu Gnome spin. As well as these official spins, many independent developers use Ubuntu as the base for their own distros. While most of these are just the stock Ubuntu release with a few added applications, some developers put in the extra effort. Bodhi Linux is a semi-rolling distro that's based on the stable Ubuntu Long Term Support (LTS) releases. It installs an elegant-looking, minimal system that can be customised easily to suit a regular desktop or a dated machine. Also featured is Zorin OS, designed to appease users moving from Windows. Comparing the distros was tricky. As they're all underpinned by Ubuntu, the usual parameters for comparison, such as installation, were very similar. 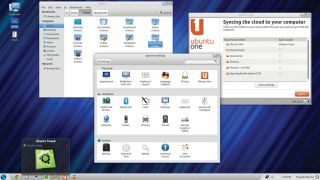 The main reason for this roundup is to help you select a distro that gives you a better desktop experience than Unity. Another important point of comparison is system requirements. Unity requires accelerated graphics, which makes the standard Ubuntu unsuitable for older computers. We also paid attention to the custom tools shipped with some distros that have their own package manager. Some replace the default tools with their particular desktop environment to increase usability. No distro comparison is complete without a look at bundled apps and configuration options, and even more so, since both of these factors depend on the desktop environment. For most distros in this roundup, the choice of default software depends on the desktop. So you'll find Gnome-apps such as Evolution, Shotwell, Rhythmbox and Totem in Ubuntu Gnome, and KDE-apps such as Kmail, Amarok and Dragon Player in Kubuntu. Although both of these distros try to remain true to their desktops, there are some exceptions. Most notable is LibreOffice, the default suite in Ubuntu Gnome, Kubuntu and Zorin. The lightweight Lubuntu uses AbiWord and Gnumeric instead, and Bodhi ships with only a basic text editor. In fact, the only real app in Bodhi is the Midori web browser, which you can use to access Bodhi's online app store and download new apps. Interestingly, Google Docs thinks of Midori as an outdated version of Google Chrome. Zorin ships with the real proprietary Google Chrome, while Lubuntu includes its open source sister, Chromium. Instead of Gnome's Epiphany browser (now rechristened simply Web), Ubuntu Gnome includes Firefox. Kubuntu ships with its own Reconq browser, although it does have a shortcut to install Firefox. In stark contrast to Bodhi, the other lightweight distro, Lubuntu is chock full of apps. It's got some GTK apps such as the document viewer Evince, Archive Manager and image editor mtPaint, along with feature-weight apps that go with its LXDE desktop, such as the Leafpad text editor and PCManFM. Lubuntu also has the Sylpheed email client and the Chromium web browser. It's also got Audacious and Gnome Mplayer so you can play most popular formats: MP3s, AVIs and MP4s etc. Ubuntu Gnome also lets you play MP3s out of the box with Rhythmbox. You won't find any plugins under Kubuntu but its multimedia apps are designed to fetch codecs as and when they are needed. The best thing about the Ubuntu derivatives is that you can install proprietary plugins and codecs to play restricted formats while installing the distro.